The Camp Fire raged through the town of Paradise in Butte County, northern California, in November 2018, almost wiping the town off the map. Angels emerged in the aftermath from all over to shine lights of hope for victims. Early in the morning of November 8, 2018, a fire started in Butte County, northern California. It grew to become the deadliest and most destructive wildfire in the state’s history. It was named “Camp Fire” after Camp Creek Road, its place of origin. Soon after the fire started, residents in the eastern part of the town of Paradise were ordered to evacuate. An hour later, that order was extended to the whole town. Skyway, the main evacuation route out of Paradise, quickly jammed up with cars as people fled in the direction of Chico, about ten miles to the west. One woman recalled that the road was so congested that a five-minute trip in normal times had taken her three hours in the big escape. With flames spreading quickly, people were terrified. After escaping from the fire that had engulfed his home, a man in his pickup truck drove down the road. He saw a few youngsters standing beside the road. He invited them to hop into his pickup, but they refused to board a stranger’s vehicle. Fire and smoke were coming toward them. He had no choice but to leave without the teens. He floored the gas pedal in an anxious rush to escape danger and luckily made it out. But as he looked at the burns on him and his half-charred shoes, he couldn’t get the youngsters who had stayed behind in the fires out of his mind. The sudden influx of evacuees soon emptied supermarket shelves in Chico. Evacuees formed long lines at gas stations. They sheltered in churches and community centers where welcoming Chico residents cooked for them. Shelters had their TVs on around the clock, broadcasting news about the devastating conflagration. The numbers of deaths and missing people kept rising. People shared their escape stories. Heroic acts, close calls, horrors, and deaths played out at the same time. Bulletin boards in shelters were covered solid with notes about missing people and their photos. The mood was one of hope, worry, and anxiety as people waited for news of their loved ones. 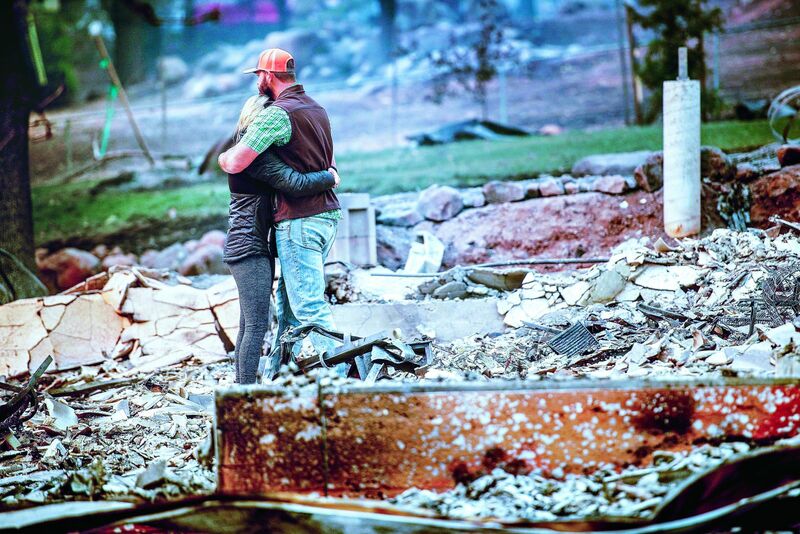 The deadly Camp Fire reduced most of Paradise to ashes. More than 18,000 structures were burned down, and over 50,000 people were forced to evacuate. Eighty-nine people perished in the fire. 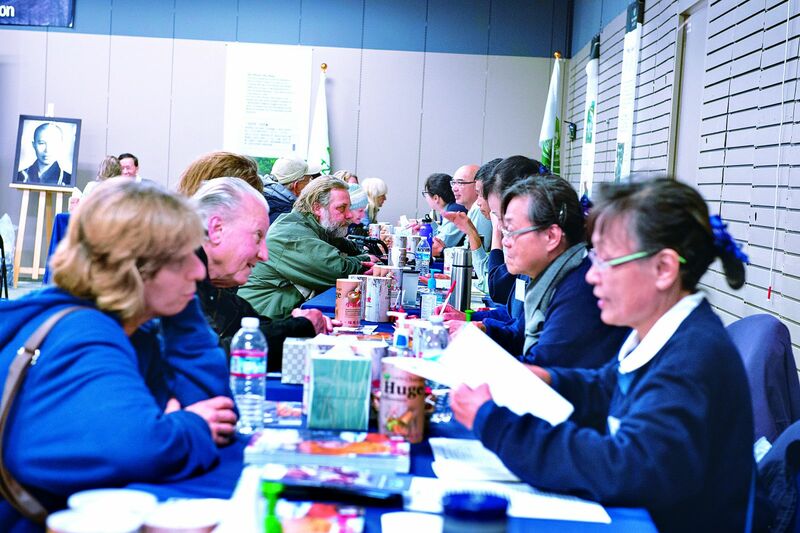 The day after the fire broke out, Tzu Chi volunteers in northern California delivered 550 blankets to three shelters. Night temperatures were often below 50 degrees, so the blankets would add a little warmth to the evacuees’ sleep—and perhaps to their hearts as well. Blanket recipients held volunteer’s ice-cold hands and thanked them for their warm-heartedness. After receiving a blanket, a woman asked a volunteer again and again the pronunciation and meaning of the words “Tzu Chi” printed on the blanket because she didn’t want to forget the people who had brought warmth to her in the coldness of winter. Gail Munro was not allowed to stay in a shelter because she had a pet with her, so she slept in a car. In fact, she had slept outdoors in the cold for a whole week when she finally received a blanket at a Tzu Chi booth where she applied for aid. “You’re an angel,” she said tearfully to volunteer Chen Bi-hui (陳碧惠). Chen hugged her and gently soothed her. 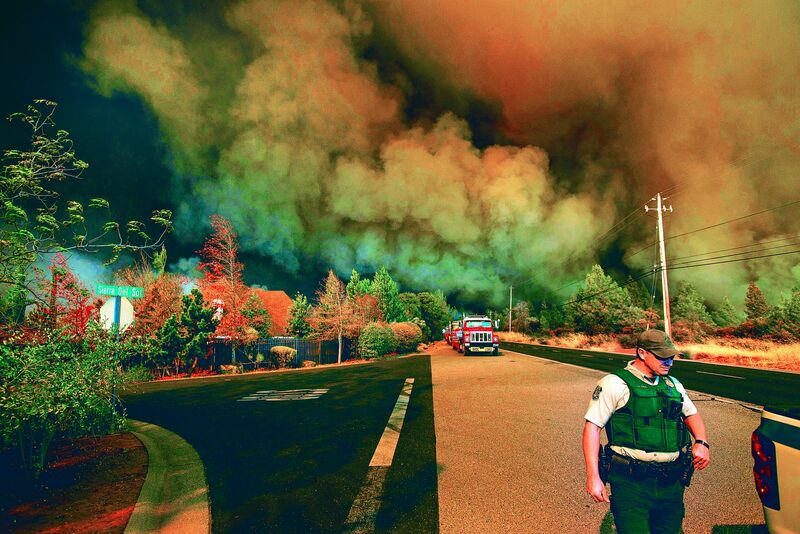 A wildfire had occurred in Paradise ten years ago. Donna Montgomery had received a blanket from Tzu Chi volunteers back then. She said she had always covered her bed with it so she could see it every day, to remind herself of the blessings from Master Cheng Yen. Sadly, her house burned down again ten years later. She cried as she recalled the horrible moments when fire on all sides closed in on her car. She thought she would die, but miraculously she made it through the flames and escaped. She even picked up two young men on her way out who had sustained burn injuries when they tried to help others. In a mere ten years, Donna was hit by two big fires. People came to her aid both times. “I keep saying that the brotherhood of man still works,” she said. She had seen the bright side of life. She felt good to be alive. A Disaster Recovery Center (DRC), jointly operated by the California Governor’s Office of Emergency Services and the Federal Emergency Management Agency, opened in Chico on November 16 to help Camp Fire evacuees. Long lines of people formed outside the DRC each day. There were older people, children, parents holding infants, mobility-restricted folks, and pets. Many people came from out of town to help. Alejandra’s family of seven set out from their home at five in the morning of November 21 and drove two hours to reach the DRC to offer donuts and hot tamales to people waiting in line. Alejandra pointed out that it had been her father’s idea to bring food there. She said that coming to the DRC to help people in need on Thanksgiving Eve was the true spirit of Thanksgiving. Tzu Chi volunteers were granted permission to set up a service station in the DRC, where fire victims could apply for cash cards from the foundation. 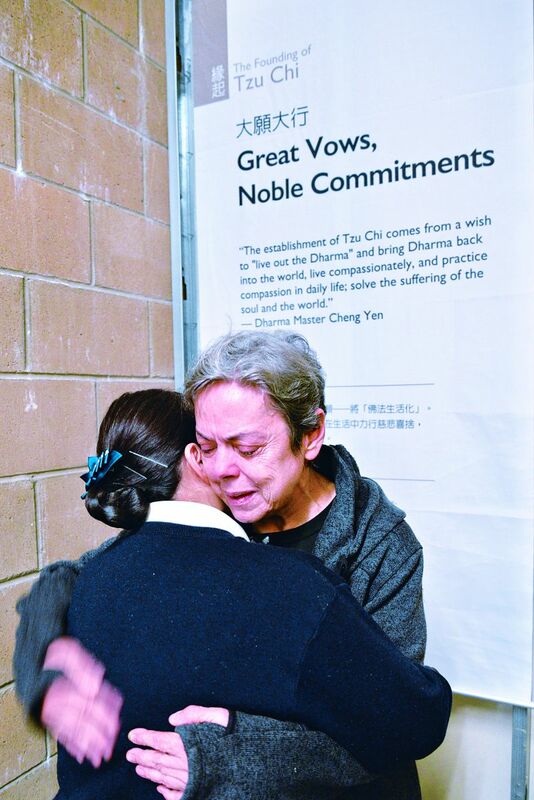 Keiley Elliott was one of the people who sought help from Tzu Chi. She told volunteers about her close brush with the fires. On that fateful day, she and some family members who lived nearby drove separately in their desperate rush to get out of harm’s way. The cars on the road were moving too slowly, and fierce fires were not far behind. Her car made it to safety, but the other car containing her family—just two vehicles behind—was engulfed by the chasing flames. Six family members of hers were in that car, one just three months old. Now Keiley and 12 people in her family were living in a trailer in the parking lot of a shelter. They survived, but she had no idea what tomorrow would hold for them. Zhang Yongxia (張永俠), another survivor, said to volunteers, “Now whenever I close my eyes, I see fire rushing toward me.” She recalled that she and her husband had rushed out of their home when the fire came, but their car had already caught on fire. Soon they were surrounded by heavy smoke when someone pulled them into a vehicle and drove away. They looked back and saw their home burning. It was the police who had saved the two of them. Chris was another cash card applicant. A walking stick in one hand and the hand of his son in the other, he walked slowly toward the Tzu Chi service station. Volunteers at first thought that he had been injured in the fire. When they handed him a cash card in the amount of 600 U.S. dollars, based on his family size, he choked up. He told the volunteers that he had been unable to work for three years because of a spinal injury. He had been on welfare, and now the fire had consumed his house, gravely adding insult to injury. He said that the cash card meant a lot to him. School would soon start, and his son would have had to go to school without any supplies were it not for the financial aid. He thanked Tzu Chi for giving them such warm assistance when they needed help. “My son and I will be strong to face the future,” he said. Shiana Chamness, 25, looked at her two children in strollers, her eyes red with tears. Her husband had not been home when the fire made its way toward their house. In a panic, she hurriedly grabbed her kids and fled. He was still unavailable to help her when she tried to find a place to stay, nor was he there when she visited the DRC for financial aid. Although he was not there to help her, he was always nearby—he was one of the firefighters working to bring the blaze under control. When she and her children were getting out of harm’s way, trying to find a temporary residence, and seeking assistance, he was putting out fires, looking for survivors or uncovering the dead, and helping families return to some sort of order or normalcy. Volunteers held Shiana’s hands as they listened to her recount her story. They hoped to help her feel less alone. After the fire, volunteers went along when some recipients went back to their homes. But sadly their homes were no more. Mark was beginning to plan to rebuild his home. He said he had a few carpenter friends who would help out. “When times are hard, everybody helps each other out, out here.” He said that it was just like the spirit demonstrated by Tzu Chi: “The foundation helping me was great because what they stand for is giving, sharing, and helping the needy people. It’s a beautiful thing.... The compassion of people has been unbelievable.” He stated that just like Tzu Chi helping the needy, he would help other people rebuild their homes. Firefighters fought furiously for 17 days before they fully contained the Camp Fire. Coincidently the Woolsey Fire in Los Angeles and Ventura counties also started on November 8. It was one hundred percent contained on November 21. Tzu Chi volunteers likewise distributed blankets and cash cards to victims of that fire. Through December 18, Tzu Chi volunteers worked 1,788 shifts to provide 5,087 blankets and 7,993 cash cards ranging from US$500 to $800 to fire survivors. 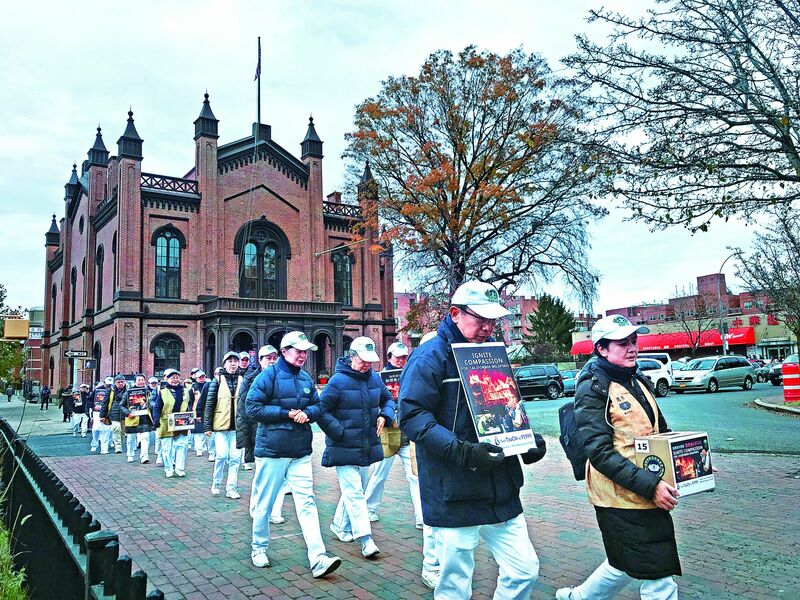 Tzu Chi volunteers from more than 200 locations in 20 American states took to the streets over two weekends in November to raise funds for fire victims. On November 27, many businesses and individuals participated in a “Giving Tuesday” fundraiser where the donations of individuals were matched by funds from businesses, effectively doubling their goodwill. On November 29, the foundation kicked off another fund drive, “Hope Heals,” to recruit donors who would each sponsor one victim family of the Camp Fire. Tzu Chi planned to help 10,000 families that were impacted by the disaster.